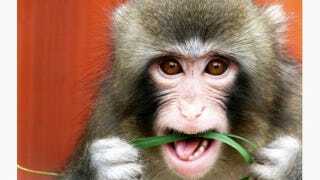 Darwin, the Japanese macaque who captured hearts and mind across the globe after getting lost in an Ikea parking lot, is reportedly "growing into a healthy, confident adolescent" at the Story Book Farm Primate Sanctuary — the place he was moved to after being confiscated from his owners by Canadian officials. "When he came to us, he was lacking in confidence and unsure how to act around other monkeys," said chair of the sanctuary's board of directors Izzy Hirji. Now, thankfully, Darwin is "learning to be a monkey again." BUT DOES HE GET TO KEEP HIS COAT? In spite of Ikea Monkey's newfound happiness, his owner Yasmin Nakhuda recently launched a lawsuit in order to get him back, telling the press, "I love him and I want him back. This is injustice. If I really felt in my heart that justice was served, then I would let it go." Yes, Yasmin. You clearly seem like the type to "let it go." Fingers crossed that Darwin gets to stay at the sanctuary. Who knows? Maybe one day Ikea Monkey will meet Bieber Monkey and the pair will fall in love. Image via Story Book Farm Primate Sanctuary.